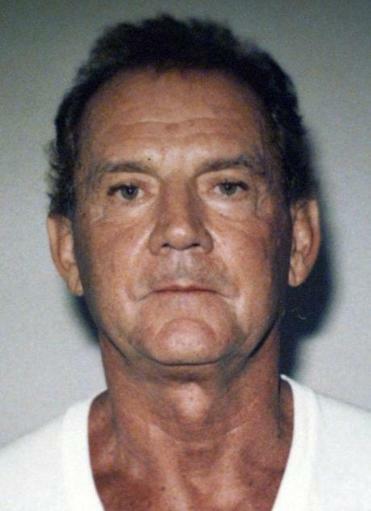 Former New England Mafia boss Francis “Cadillac Frank” Salemme was found guilty Friday, along with an associate, of killing a South Boston nightclub owner 25 years ago to prevent him from cooperating in a federal investigation targeting the mobster and his son. The verdict signified long-awaited justice for the family of Steven DiSarro, a 43-year-old father of five who disappeared in 1993, his whereabouts a mystery until the FBI found his remains two years ago, buried behind an old mill in Providence. US Attorney Andrew Lelling said the conviction of Salemme, one of the last of the old-school Mafia bosses, “in some ways ends a long and dark chapter in the history of our city” — a bygone era when La Cosa Nostra and the Winter Hill Gang were the region’s most feared criminal groups. Following a five-week trial in US District Court in Boston and four days of deliberations, a jury of eight women and four men convicted Salemme, 84, and Paul Weadick, 63, of Burlington, of murdering DiSarro to prevent him from becoming a federal witness. 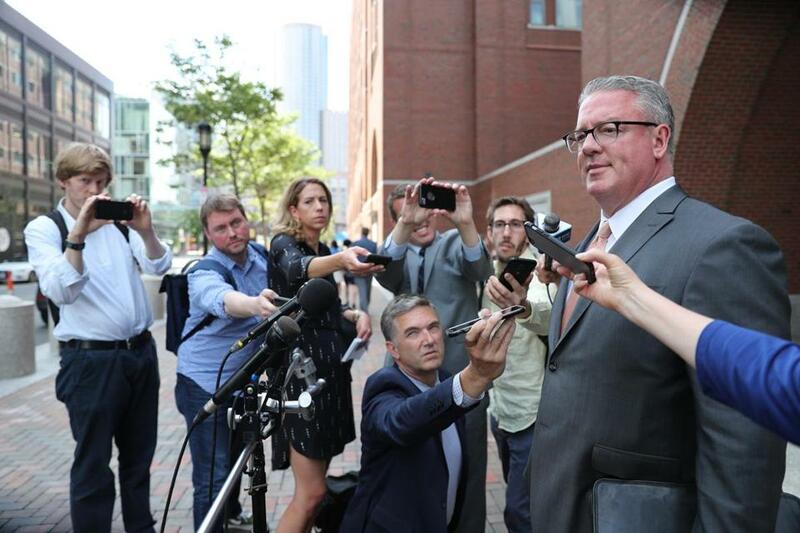 It’s a courtroom drama that Boston may never see again, featuring former street legends that the federal government considered the most menacing criminals of their time. Salemme, who became a government witness himself six years after killing DiSarro and was in federal witness protection until his 2016 arrest, will probably spend the rest of his life in prison, as will Weadick. The murder conviction carries a mandatory life sentence. Salemme will appeal, according to his lawyer. Weadick’s attorneys left the courthouse without commenting. Judge Allison Burroughs set sentencing for Sept. 13. Salemme and his late son had a hidden interest in DiSarro’s club, the Channel, which was located on Necco Street and demolished years ago. When the verdict came down around 3 p.m., Salemme appeared stunned as he remained standing for a long time, taking his seat only after his lawyer told him to. Dressed in a gray suit, white socks, and black shoes, his shoulders were hunched by age and his head was bowed as he was escorted away by deputy marshals. The government’s star witness was Stephen “The Rifleman” Flemmi, 84, who is serving life in prison for 10 murders. He testified that he dropped by Salemme’s Sharon home on May 10, 1995 and saw Salemme’s son, Frank, strangling DiSarro while Weadick held his legs and Salemme looked on. Salemme’s son died in 1995. Flemmi said Salemme told him that he knew DiSarro had been approached by federal agents and feared he would cooperate in a federal investigation targeting him and his son. 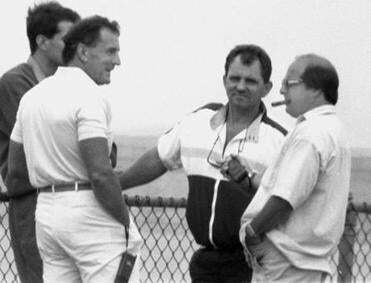 Two former Rhode Island mobsters, brothers Robert and Joseph DeLuca, testified that they helped bury DiSarro’s body after Salemme personally delivered it to Providence. Salemme, who was admitted to the federal witness protection program after testifying against corrupt FBI agent John J. Connolly Jr. years ago, was living in Atlanta as Richard Parker when DiSarro’s remains were found in 2016. He and Weadick have been in custody since their arrest two years ago. Attorney Steven Boozang answered questions after the verdict. Asked about Salemme’s relatively stoic demeanor in court, Boozang said, “He’s done a lot of time. He was in the gangland wars, so I don’t think much fazes him or shocks him. He was hopeful and optimistic” for an acquittal. Harold Shaw, the special agent in charge of the FBI’s Boston office, said that for 25 years Salemme and Weadick “thought they had gotten away with murder” and continued on with their lives while DiSarro’s family agonized over his loss. 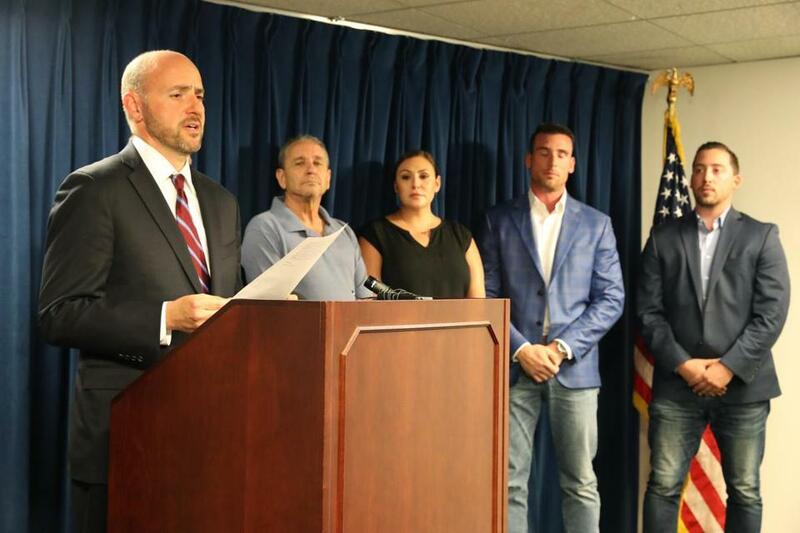 BUS Attorney Andy Lelling read a statement from the victim”s family, (l-r) Roland Wheeler, Colby DiSarro, Nicholas DiSarro, and Michael DiSarro. DiSarro’s children — Nick, Michael, and Colby —and his stepbrother, Roland Wheeler, stood beside Shaw and the prosecutors, as the US attorney read a statement from the family, saying the trial finally answered questions about his fate and gave them some closure. Travis Andersen of the Globe Staff contributed to this report. Shelley Murphy can be reached at shelley.murphy@globe.com.